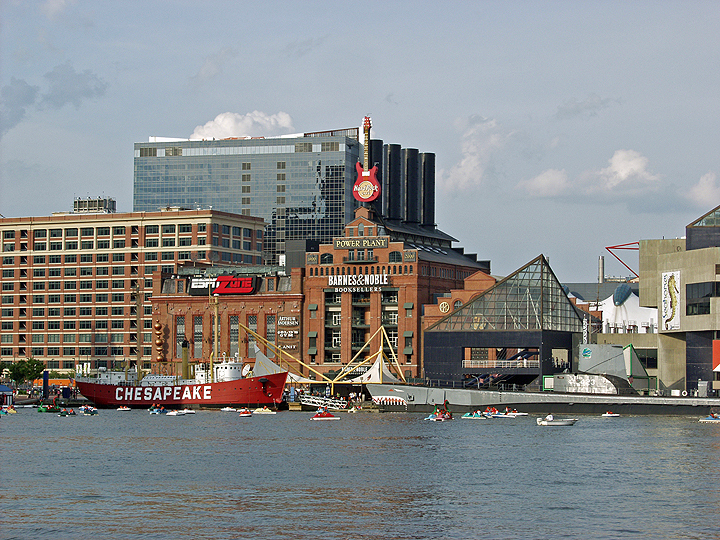 The Power Plant Entertainment Complex, 2002: One of the biggest structures at Baltimore's Inner Harbor, the "Power Plant" was originally built in three stages between 1900 and 1909. It was a functioning power plant, providing electricity and steam heat to downtown buildings until 1973. The city bought the plant from Baltimore Gas & Electric in 1979 and converted it to an indoor Six Flags urban theme park. The endeavor was unprofitable and closed after only 4 years of operation. Subsequently, in the late 1990's, in a partnership between the city and developers, it was converted into a thriving, mixed-use development that is now considered one of the leading entertainment projects in the U.S. The main power plant building is home to the nation's first ESPN Zone, a Hard Rock Cafe, Barnes and Noble, and a Gold's Gym. The adjacent Power Plant Live houses a collection of 15 different entertainment venues (restaurants, bars, dance clubs, dueling piano bars, etc. ).